My three hiatus from the hobby, has resulted in my collection lacking any cards from 2010-11 & 2011-12 releases. This is not something I feel happy about and have decided to rectify. Although I fully expect to purchase some autograph cards from the forthcoming 2011-12 Panini Limited & Gold Standard releases, there is one small chase that I have decided to start on immediately. 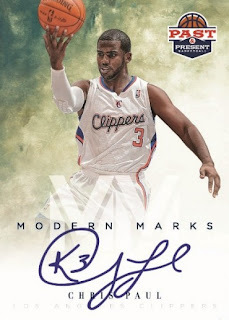 The set in question is the ten card 'Modern Marks Autographs' insert set from the 2011-12 Panini Past & Present release. The autographs are all on-card, with a design that jumped out at me when I first saw it previewed by Panini earlier this year. The checklist also includes some younger stars (Derrick Rose, Chris Paul, Kevin Love and Blake Griffin) that are under represented in my collection. I have already purchase two cards from the set, which I will showcase on their arrival, but I have eight more to go. So if anyone reading this blog knows of any cards from this set for sale to trade, then please hit me up via my Contact Me page.